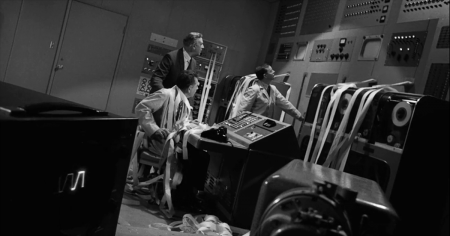 It did not take long for The Twilight Zone to hit its stride. 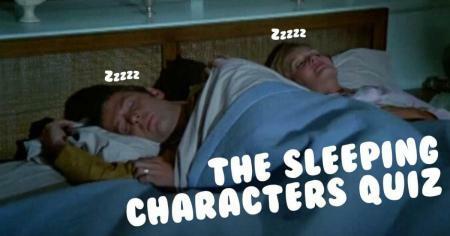 In its first season — before that eerie dee-dee-dee-dee opening theme music had even been written — the anthology series delivered some of its most iconic episodes. Burgess Meredith wearing his thick spectacles. Inger Stevens passing a mysterious hitchhiker on a cross country road trip. 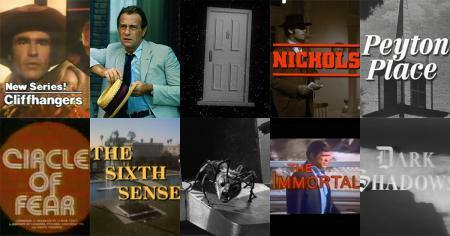 These Rod Serling-written tales aired in the first few months of the show. 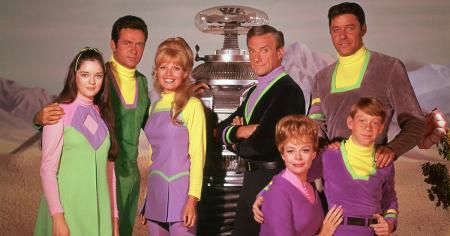 Now that's classic television making. "Mirror Image" stands out from the field as another first season gem. 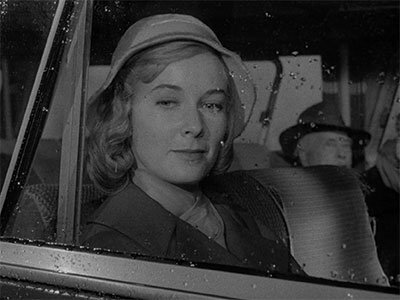 Vera Miles, who would star in Psycho later that same year, portrays Millicent Barnes, a young woman waiting for a bus in Upstate New York in the middle of the night. When she approaches the ticket agent for an update on her late ride, the man behind the counter shoos her away, saying he's tired of answering her questions. Only, this is the first time she's spoken to him. Weirder yet, she spots her suitcase — which she swore she just left over by the bench — behind the counter. Poor Millicent slowly begins to lose her grip on reality as her silent doppelgänger pops up around the sleepy little depot. 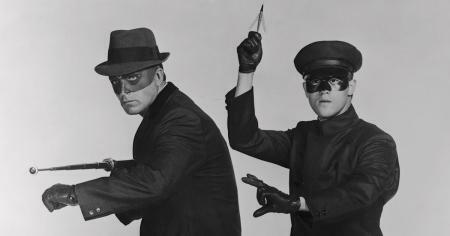 A helpful fellow (Martin Milner) comes to her aide, only to send her off to the loony bin with the police. This being The Twilight Zone, his sanity slips at the twist ending. Serling's tidy script shows the fragile psyche of normal people. He devilishly demonstrates how one ripple in the fabric of our reality might unravel us. The doppelgängers are never fully explained, which makes it all the more unsettling. 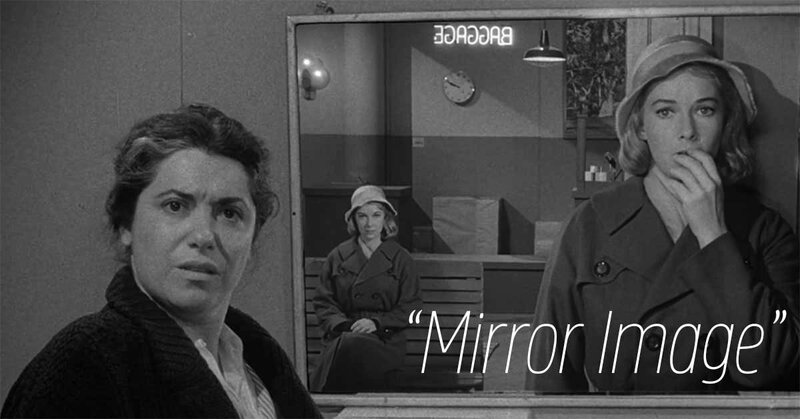 No wonder that fans cite "Mirror Image" as one of the creepiest episodes of The Twilight Zone. The story still continues to sway modern filmmakers, as demonstrated by Us, the blockbuster horror film inspired by "Mirror Image" and directed by Jordan Peele, the man who not-so-coincidentally rebooted The Twilight Zone. The bus route had a personal connection to Rod Serling. Millicent is stuck waiting in the Southern Tier region of New York, between Binghamton and Syracuse. Specifically, she is waiting for a bus to Cortland. All of these cities are mentioned by characters. Martin Milner even mentions the tiny town of Tully, where he has a friend with a car. All these places lie along Interstate 81 and were quite familiar to Serling. The Twilight Zone creator was born in Syracuse and raised in Binghamton. Parallel universes were a revolutionary new concept. A little scientific context helps to underline just how mind-blowing this episode was to audiences in early 1960. After Millicent spots her double aboard the bus, she faints. A short while later, when she comes to, Millicent offers her explanation of what is happening. She explains a scientific article she has read recently about parallel universes, alternate planes of existence that exist on top of ours. This was a heady, rather new concept even to physicists. Pioneering quantum physicist Hugh Everett delivered his "many-worlds theory" in 1957. Parallel universes are a common concept in modern sci-fi, from Marvel movies to Fox series like Fringe. But "Mirror Image" might have been the first time that viewers heard of such an idea. Like we said, mind-blowing, right? The clock keeps perfect time. If you really want to nitpick continuity editing in a film, watch the clocks. 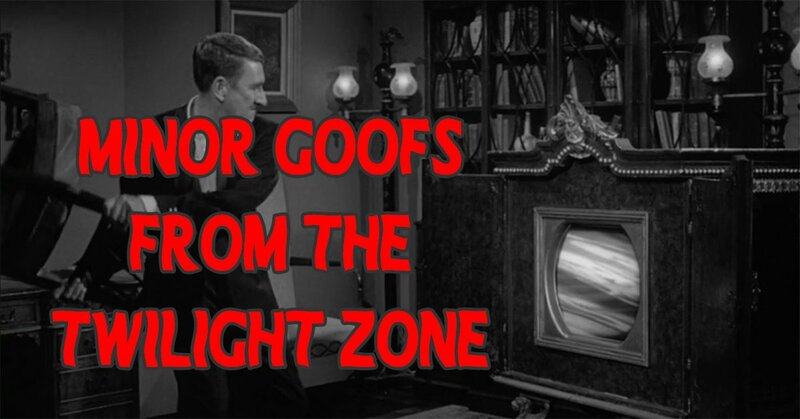 Well, do it elsewhere, because this Twilight Zone is perfect at keeping time. 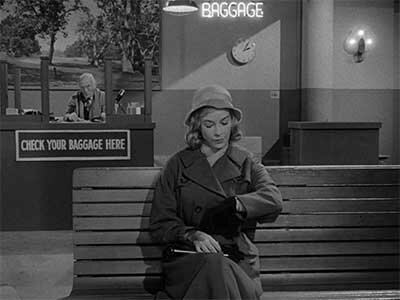 Millicent approaches the ticket agent at around 2:05 a.m. From then onward, the minute hand is precisely where it should be. 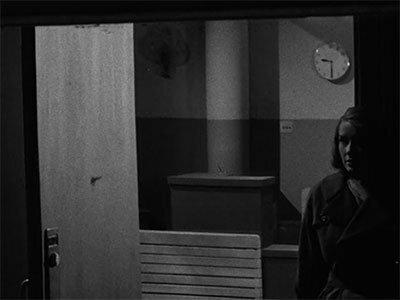 Later in the episode, when the station agent says that the next bus, the 7 a.m., will arrive in 4.5 hours, the clock indeed reads 2:30 a.m. in the mirror, as seen here. In the mirror, it reads 9:30 p.m., which is about what time it would have been if you were watching live in the Central Time Zone. We love the portentous blocking of the neon "LADIES" restroom sign. 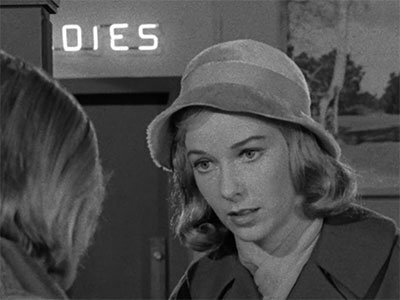 An obstructing pillar in the shot leave the word "DIES" glowing above Millicent's hat. Call it a red herring— or perhaps a dark glimpse into her fate. Even the newspaper rack had hidden meaning. A newspaper rack against the way features an ad for "Ernie Mason." 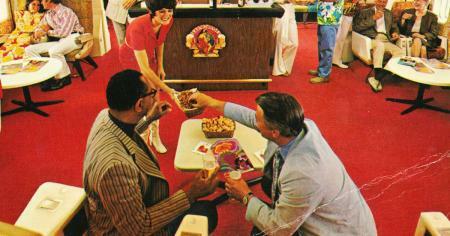 Mason was perhaps the most widely known syndicated horse-race handicapper. If you wanted the odds for the ponies, you picked up Ernie Mason's column. 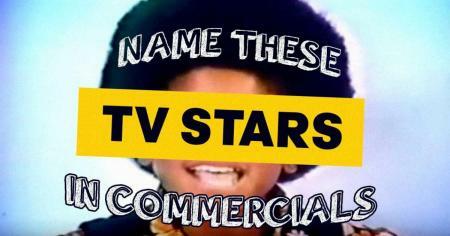 Vendors would shout, "Ernie Mason! Lucky Louise!" when a fresh sheet came off the printers — Lucky Louise being a female counterpart invented for his column. 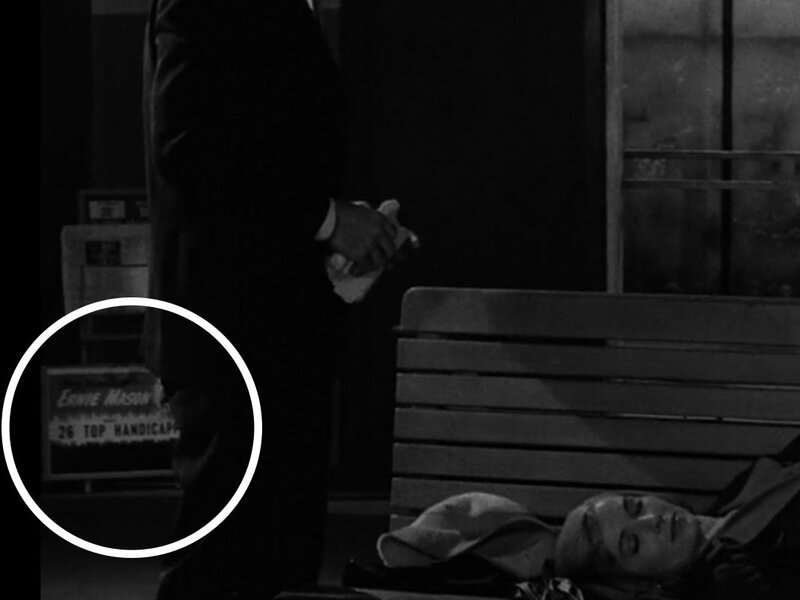 This might just be set dressing, but with Serling's attention to detail, it's possible this is just another clue that our lives are little more than chance. The crotchety old ticket agent was a citizen of Mayberry. Joseph Hamilton portrayed the snapping man behind the ticket counter. Loyal viewers of The Andy Griffith Show might recognize his face. Hamilton popped up in 11 episodes of the sitcom, playing old-man characters like Chester Jones, Jase and Choney Latham. 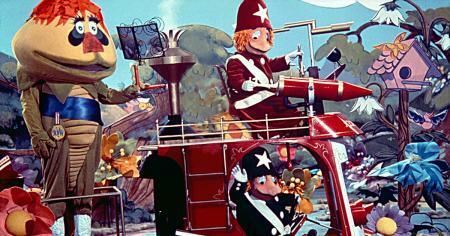 He passed away shortly after his final appearance on the show, in 1965. 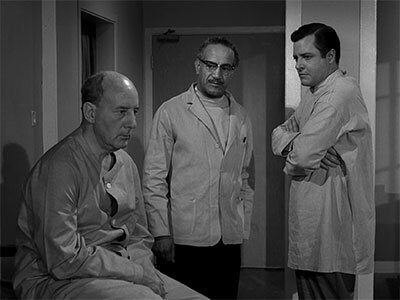 The director made a cameo in another Twilight Zone about slipping sanity. John Brahm deserves some credit for the style and detail of "Mirror Image." The German-born director had his roots in horror. He also helmed the season-three episode "Person or Persons Unknown," which had very similar themes to "Mirror Image." Instead of a woman discovering there are two of her, a man awakens to discover nobody remembers him. In a later scene, a doctor points out a cracked, silent man who believes he is "Winston Churchill." It's Brahm playing the part, in the only screen appearance of his career. This was the final screen credit of the old woman. 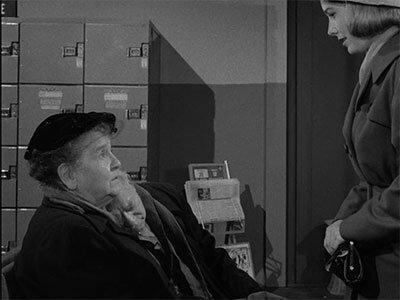 Millicent asks an old couple if they've seen another woman like her wandering about the station. The actress is Therese Lyon, and this was her final credited role. Naomi Stevens, who played the restroom attendant seen in the top image of this story, later had recurring roles on My Three Sons, The Flying Nun and Vega$.